BAI offers a wide spectrum of legal skills training courses. Course offerings cover the entire dispute resolution continuum from the initial client interview through the appeals process. Our classes are taught by some of Houston’s most distinguished judges and lawyers. Please check the UHLC Course Schedule to determine which classes may be offered only in certain semesters. 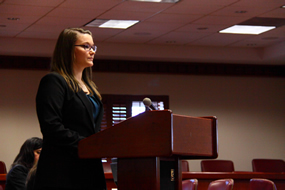 UHLC student Mary London Lehman shows off her appellate advocacy skills. This unique course is designed to provide students the opportunity to experience a wide spectrum of legal advocacy. Course segments include Pre-Trial Litigation, Trial Advocacy, Appellate Advocacy, Negotiation, Mediation, and Arbitration. Each course segment contains a brief overview of 1) the legal underpinnings for each topic area and, 2) the skills necessary to be an effective advocate in that topic area. Advanced research, writing and oral advocacy are the goals of this course. Students have the opportunity to advance their research and writing skills under the tutelage of some of the finest appellate lawyers and judges in this state. This program has been instrumental in developing an interscholastic moot court program that has produced many national championship teams during the past six years. Additionally, many appellate judges have noticed the enhanced quality of law clerks that participated in the Appellate Advocacy Program. Art of Advocacy: Trial Persuasion in a Polarized World: 3 Credits. Throw out the old and embrace the new: we now have a highly polarized country where members of a jury with totally divergent views still have to agree on a verdict. Learn from real litigators about how to handle a case in this environment. This class highlights cutting edge techniques for persuasion and trial advocacy. Become comfortable with the art of case assessment, work-up, visual storytelling, case framing, arguing motions before a judge, developing and defending against safety rules, examination of witnesses and composing a winning closing argument. Then practice, practice, practice as each week you put into action what you learned the week before. The Client Interviewing course emphasizes a “client-centered” approach to interviewing and counseling techniques. The course will touch on the major aspects of the attorney-client relationship, including (1) the initial client interview; (2) billing arrangements; (3) case analysis, development and strategy incorporating the client’s input and expectations; (4) preparing the client for negotiations, depositions, settlement discussions or trial; (5) terminating the attorney-client relationship; and (6) collecting fees. Students will engage in mock interviews and counseling sessions throughout the semester. The professor and classmates will provide constructive feedback after each session that can and should be incorporated into future practice sessions. Criminal Litigation and Legal Issues in Criminal Procedure: 3 Credits. Criminal Litigation Practice is designed to incorporate the substantive law of criminal procedure into a trial advocacy course. The course will cover virtually all of the stages of a criminal case—from the probable cause hearing through the sentencing hearing and hearing on a motion for a new trial. Most of the issues addressed in this course implicate federal constitutional law principles applicable to all criminal prosecutions, whether they occur in state or federal court. Through a combination of lectures and in-class exercises students learn how to effectively prepare for, conduct and use depositions in both pretrial litigation and at trial. International Arbitration Advocacy: 3 credits. International arbitration is a growing field and increasingly is the mechanism by which the largest international commercial disputes are resolved. This course has two primary aims: (1) expose students to international arbitration practice; and (2) provide students with the skills they need to represent clients effectively in international commercial arbitrations. The backbone of the course will be a mock arbitration with the students advocating the entire matter through each stage of the arbitration process. The skill of negotiating is required in all areas and all phases of legal practice. The purpose of the negotiation seminar can be described in terms of providing participants with a theoretical framework and practical tools for resolving issues on favorable terms while maintaining or enhancing relationships. The objectives for the course are to help participants better understand the significance of process in negotiation, the importance of preparation in achieving objectives, and the value of adherence to fundamental principles; to provide participants with practical tools to prepare more effectively, to organize thinking to help make critical decisions, to adopt and implement effective negotiation strategies, and to learn from future negotiations; and to help participants improve negotiation skills. This course stresses pretrial practice in civil cases. The objectives include educating students about what they will actually do as lawyers with an emphasis on drafting, strategy, and methods. The course is taught experientially with an emphasis on writing and oral advocacy. During this course, each student will be assigned to either a plaintiff team or a defense team. Students will then develop one civil matter throughout the pretrial process from the initial pleadings through the summary judgment phase. Students will investigate the law and the facts of the matter; review relevant documents and witness statements; and draft appropriate pleadings including: 1) a Petition or Answer; 2) various discovery requests and responses; 3) appropriate discovery and dispositive motions, potentially including Plea in Abatement, Special Exceptions, Motion to Compel, Motion for Protective Order, Motion for Sanctions, and/or Motion for Summary Judgment; and 4) Notices of Deposition. Students will conduct depositions of fact witnesses, and will argue for or against motions filed in the case, including at least one argument in open court before a sitting judge. Students will prepare a trial notebook that will be turned in at the end of the semester. Through historical and personal stories, the instructor demonstrates various storytelling techniques and principles. The American tradition of permitting citizens to redress wrongs by trial to an independent jury is a proud and noble one. Students are encouraged to understand its history and work to preserve it. Trial Advocacy: 3 Credits. Prerequisite: Evidence*. The trial advocacy course is the foundation of litigation training and is essential to the understanding of the legal process. During the course, students try both civil and criminal cases because the substantive, evidentiary and procedural laws are different for each. Indeed, except for the desire to win, even strategy differs between criminal and civil cases. In addition to refreshing and refining their knowledge of evidence and procedure, students are taught to think by formulating a case theory, theme and strategy; to communicate more effectively by designing and orally presenting opening statements, closing arguments, direct and cross of fact and expert witnesses, voir dire, evidentiary objections and responses, and all other aspects of actually trying a case before court and jury. The skills they learn are utilized in all phases of practice from client interviewing to appellate review. It has been said that graduates of this program are becoming increasingly sought after by law firms because they realize that this training advances them beyond the training of the usual beginning attorney. Click here for course materials. *Evidence may also be taken concurrently with Trial Advocacy. Trial Advocacy for Non-Litigators: 3 credits. Trial Advocacy for Non-Litigators provides students who do not have any trial experience with a chance to gain basic litigation training. This class is ideal for students who plan to pursue a career as a transactional attorney but want to acquire the knowledge and skills required to try a case. The class is a mirror of the evening trial advocacy class, so students will learn the skills of case analysis, direct examination, cross examination, opening statement, closing argument, and voir dire. Evidence is not a requirement for this course. Evidentiary issues relating to the case files will be identified by faculty and discussed in class. Trial Strategy and Case Management: The Art of Winning at an Unfair Game: 3 Credits. Voir Dire: Art of Convincing Strangers to Speak Freely: 2 Credits. This course will focus on in-depth analysis, planning and practice of preferred systems and techniques for complex negotiations involving both hard and soft interests. The analytical skills to be emphasized are (1) Identification of interests, (2) Analysis and improvement of each party's BATNA, (3) Development of options, and (4) Assurance of transparency, implementation and enforcement. Class size is limited to 12 students in order to assure the faculty/student ratio necessary for in-depth analysis and training. Advanced Trial Advocacy: 3 Credits. Prerequisite: Trial Advocacy. The focus of this course is on persuasion and methods for causing a judge or jury to view evidence from a litigant's perspective. Emphasis will be placed on developing a persuasive theory of the case, constructing opening statements and closing arguments to present the case theory, presenting expert testimony, and planning the presentation of evidence so as maximize its effectiveness.